Things finally moved, but in what direction? 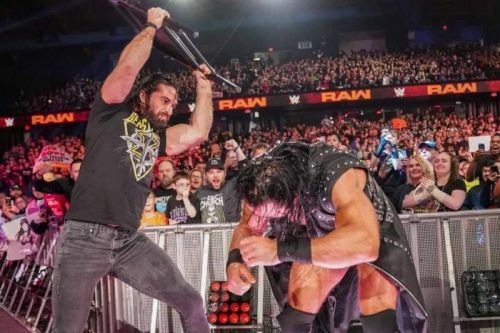 Last night's Raw was an attempt to establish the home stretch moving into WrestleMania 35, but it was a bad attempt. Unfortunately, we can't say that this was very surprising. Raw has been in poor form ever since last year's Superstar Shakeup. Nothing particularly major occurred on last night's Raw, despite the return of Brock Lesnar. What we got was the usual with him. Who managed to walk away a winner from last night's episode? This match was pedestrian, but at least it got the ball rolling for WrestleMania. Finn Balor vowed to win the Intercontinental Championship back and staked his claim last night. Midcard title matches are never singles affairs at WrestleMania anymore, so it's feasible these four could be the competitors in it. Maybe add one or two more and a ladder stipulation. For Lio Rush in particular, it would be a huge win, going from in danger of being released, to 205 Live, to WrestleMania in less than a year. For Braun Strowman, it's a better prospect than what he did last year, but then again, almost anything would be. What a disappointing, flat, and less than glamorous announcement. Kurt Angle having his retirement match against Baron Corbin? Is John Cena not available? Would it not have made a lot more sense to put Aleister Black or Ricochet in that situation and give them a huge rub? It's a huge moment for Baron Corbin, certainly, and shows that WWE will continue to value him as a heat magnet, but this still feels like a wasted opportunity compared to the spectacle of a Cena match or the notoriety it would give to one of the NXT superstars.